On 29 March, Baba began staying in the box-like cabin in Sai Darbar. He continued writing his book there and would leave only at noon for his daily round of inspections, and return there at 6:00 P.M.
On Tuesday, 29 March 1949, Baba walked two miles to the village of Dilwara near Mount Abu. There he worked with an old yogi named Bengali Baba, who had been living in a cave for the past 40 years. 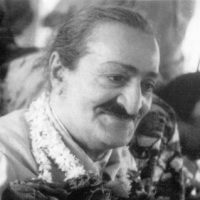 On Thursday, 29 March 1956, at 8:00 A.M., Baba, accompanied by Eruch, Pendu and Nilu, set out in Meherjee’s car to bow down at 56 shrines and to 56 poor people. From Satara, they went first to Meherazad, arriving at 12 P.M. Adi Sr. brought their lunch from Akbar Press and was given certain instructions about the financial accounts and about publicizing God Speaks. Chhagan was called from Bhingar to do nightwatch.